Do you love the idea of going camping but dread the stress of figuring out how to put your tent up? For us, it was always a hassle to put up the tent, especially when you only bring it out once in a while, and can't remember which pole goes well, and which part gets pulled down where! If only there were self erecting tents! Look no further, we have gone through the pain of setting up complicated tents, now we know the best easy to assemble tents. Luckily, designs these days have focused on this problem, and the best instant tent can be erected within a few minutes, and taken down just as easily with these easy set up tents. They make it so you can begin enjoying your holiday as soon as you get to the campsite without any concerns about finding the right pole for the right groove. 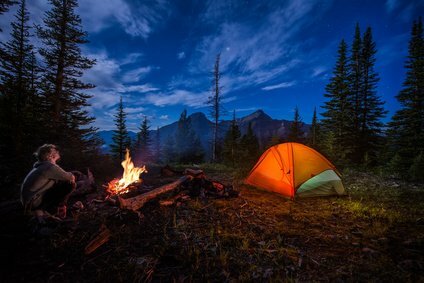 In this article we will go through the different factors we think you should think about when buying one, and provide some instant tent reviews of the best ones out there, to help you decide which is the best for your needs. With improved materials and technology, manufacturers are now making tents that have very little setup time, which means you can get to the fun part of chillaxing on your camping trip! This is typically achieved by sitting back with a cold beer in your hand while watching your family or friends arrange the pre-assembled tent​(including the poles) in a way that allows it to be folded up, so when put it in place you simply need to unfold it and peg it into the ground. They are particularly great for people who haven’t setup a tent before, or who want to avoid that process as much as possible. There’s a wide range of easy set up tents, so there’s sure to be one that meets your requirements. There are, though, some things you will need to consider before making your purchase that will affect which product to go for. What are the best easy setup tents? This 4 person tent from Coleman has been designed to be as easy to set up as possible, ​with a one piece design which we think is a very clever idea. It means there's no additional parts that you could lose, and it's fool-proof, basically just click and lock everything in place. It has a floor space of 8 feet x 7 feet, which is enough for four people to sleep snugly next to each other, or for two people to sleep comfortably with plenty of surrounding room. You can even fit a queen-sized mattress in there which is very comfortable. ​It has good head room as well, since it's more of a cabin, so very easy to maneuver around! The WeatherTec system uses a combination of welded floors and inverted seams to prevent water from getting in, though we did find in very heavy rain, some water did run down the sides, very minimal though. When the windows were zipped up, against the rain, ventilation was quite poor as well. Pretty stuffy in there! ​There are two storage pockets for you to keep the essential items in, toiletries, flashlight etc. and the fabric ​seems very sturdy. ​The tent weighs 18 pounds, so we wouldn't recommend it for hiking long distances, ​but it’s small and compact when packed away so won’t take up too much space. Perfect for near the vehicle camping! 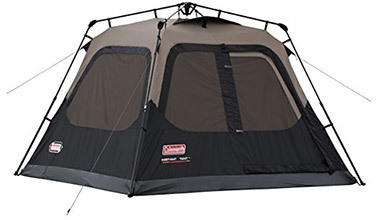 This large instant tent from Coleman provides enough space for 8 people to sleep in, although it’s probably better suited to six people, and can be completely setup within a few minutes. Set up is doable as one person, though of course it's a bit easier with a buddy to help. Here's an easy list we found to set up your tent. 9. Tent should be standing fine now but for more support, stake out guy lines about 3-4 feet out. Tighten lines and tent should be nice and solid! The floor area is 14 feet by 10 feet, which will even allow you to fit two queen-sized airbeds, and with a height of 6 feet 5 inches there is plenty of space for you to stand up and move around. You will also get a divider so you can ​turn the main space into two separate rooms. There are 2 doors and 7 windows, each of which is mesh lined to allow an impressive amount of ventilation while preventing bugs from getting in.​ Awesome ventilation, and of course, you get more outside views from all angles of the tent! This spacious tent from CORE provides all the space and features you will need for a family to go camping. It provides a 14 feet x 9 feet floor, which is plenty of room to fit two queen sized air mattresses. It is a cabin design, so reaches a lofty height of 6 feet 6 inches tall to provide space for most people to stand up and move about. 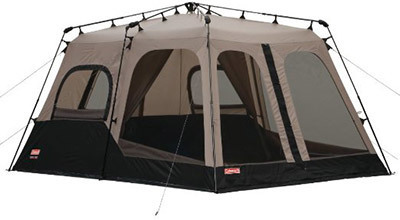 The pre-assembled frame makes this a very easy large tent to set up, and you will be ready to go in 60 seconds. Many people have found it can even be set up in less time! It's a very easy setup. It does, however, weigh about 36 pounds so even though one person can set it up, it might require two people to carry it to the location to start with. Because of the so many windows, ventilation is extremely comfortable in this tent, especially in hot weather. There's even a panoramic roof view to see up to the stars! The H2O technology uses water repellent fabrics, sealed seams, etc. and it's pretty impressive in rainy weather, though it might not hold up in extreme windy weather as well. Many people have noticed that the front 'door' isn't properly attached to the bottom of the tent. There are flaps and Velcro to hold it in place, but it doesn't take much for the flap to open up. You don't want creepy crawlies, or rain coming in, so this can be a bit of a minor issue. But the great thing is that one side of the tent opens up completely so you can move air beds, luggage etc. in and out easily. It also makes hosing out the tent less of a chore! 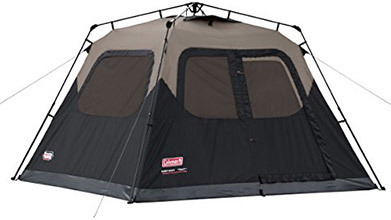 This 6 person tent from Coleman is a perfect size for four people to comfortably sleep with surrounding storage space, or of course, for 6 people side to side. ​It is built with pre-attached poles so you can set it up in only a minute​, something that several campers in this video proved can be done in 60 seconds, or even less! Coleman’s WeatherTec system, that we've mentioned before,​ uses welded floors and inverted seams, to help prevent water from getting in. It's been found that in moderate rain, the WeatherTec system is sufficient, but in heavy, constant, downpours, you may get some leakage. ​There's also two roof vents, that can be unzipped and raised up on a prop to maximize ventilation. This is pretty neat and definitely a welcome feature! ​Two pockets on the inside give you storage room for the important items, though it would be nice to have more (especially for a tent designed for 6 people!) and a conveniently placed hook allows you to hang a lantern or lamp. This tent is pretty nifty, and the handy expandable carry bag is useful for storing the tent as it actually fits in comfortably with minimal effort! Just fold the tent as per the instructors, roll it to squeeze the air out, and pack it in the lengthwise bag. It even has straps and buckles in case you can't initially zip it up! 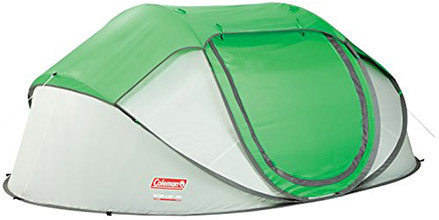 If you’re looking for an instant tent for ​one or two people, then this model from Coleman will be perfect. It is lightweight, easy to carry, and really simple to set up. Most people have found they set up the tent by accident, as it can spring open aggressively fast when you pop it out of the carrying bag. TIP: Don't even peek into the bag​ inside a small, cluttered room, or near people, without possibly causing a commotion or mini attacks! ​The good thing is that it also packs down very quickly too, with one reviewer claiming it packed down in 5 seconds. ​The tent includes two convenient pockets inside for storage, and has a multi position rainfly that can be moved to help achieve the best balance of protection against the elements and allowing a decent flow of air. ​It is available in two sizes; a two person or a four person version. Of course with most tents that we've found, even though it claims to fit that many people, be aware it will be a tight squeeze, so always go up a size if you want some more breathing space! The door does seem to be a bit flimsy, and unfortunately, if it's been raining and you open the door, it will hang down in the tent, which means any rain on the door will run down inside. You might also find you need two hands to unzip the door, but we usually do this on all tents so as not to stress the zipper. Definitely lasts longer if you're careful with it! We love the mesh roof window so you can see the stars above, unless you don't close it and it starts to rain during the night! !​ ​It's also really convenient how this tent packs up flat, and​ will be easy to store it wherever you want. It will pack up as a circle though, so not the most easiest shape for backpacking unless you can rig it up on your back and you don't mind looking like a Ninja Turtle! If you're looking for literally an instant pop-up tent, without the bells and whistles, that you won't be using in rough or tough conditions, then this is such a convenient tent that's handy for small groups. Instant Tents are available in different sizes, and are designed to simplify the process of setting them up. These easy set up tents mean you won’t be left to figure out where to poles go, instead they come pre-assembled so you just need to unfold them. This added convenience, however, has its minor drawbacks. They aren’t as sturdy in windy weather because they are more flexible, less rigid, and they can also prove tricky to pack away once you are done. In our experience however, once you've done it a few times, it's actually super easy that even the kids can help! The most important decision to make about your self erecting tent is the size. Manufacturers provide guides on this by designating the number of people that it is designed for, but this doesn’t necessarily reflect how many people can be comfortably accommodated within. A four person tent, for example, will have enough room for four people to sleep next to each other on the floor, but this will be rather cramped and there won’t be much space for storage or moving about. Ideally you will have a tent with space to live in and to be comfortable. A four person tent will, with this gauge, be well suited for two adults or an adult with two children. As a general rule you will want the berth of the tent to be one or two people larger than the number of adults that will be using it. With this in mind, you don’t want to go for one that is way too big either. The larger the tent, the more space it will take up when it is packed away, so you’ll need to be sure you can carry it in your car alongside everything else you need for your trip, and it will also take up a larger space on the campsite which may not be possible, or cost more for a larger plot. This is even more important if you will be hiking before setting up the tent, because you will have to carry this weight with you. The conditions you plan on camping in will affect the type of pop up tent that you require. Summer tents, for example, tend to be made from thinner materials and prioritize ventilation to keep you feeling cool in warmer weather. Their design features aren’t so suited for changeable weather, though. In these cases you are more likely to need a three-season tent, which is designed for use at all times of the year apart from winter. They are stronger to withstand varying conditions, will still provide ventilation, but also focus on their ability to keep water from getting in. Because of their versatility, these are the most common types of tent, and the most popular ones with consumers. All season and winter tents are a much tougher design that will withstand even tougher environments and keep you warm throughout. The extra materials needed to do this mean that they are more expensive, and not so great in warmer weather. As said earlier, instant tents are not so effective at withstanding windy weather so, depending on the environment, they may simply not be appropriate for your needs. Manufacturers will provide the details of the tents strengths, so make sure you look into this before buying one. This factor works in conjunction with the overall size of the pop up camping tent. While the small versions will only have one room, the larger ones can offer a number of different areas. This could be in the form of a porch, a second room, or the provision of a screen that will separate the main area into two. This provides extra privacy, storage space, and areas to live when you are awake. Sometimes the weather will prevent you from wanting to go outside, so the more areas for activities other than sleep, the better. Extra storage features may be included so you can keep all of your equipment in your tent with you. You might also have hooks for lamps, openings for electrical cable access, and well-positioned vents to encourage air flow. If you are camping with children, the ability to have separate areas is especially useful because it will give them the chance to have their own privacy. It also means that you will be able to put them to bed in the early evening and not worry about disturbing them when you go to bed yourself. Some dividers are simply held in place with a zip, so it’s perfectly easy to get through if the need arises overnight without even needing to get out of your sleeping bag. One of the things people look forward least about camping trips is the chore of putting up and taking down the tent. ​The best instant tent, on the other hand, will be setup in a matter of minutes, and with so many different sizes available you’ll be able to find one that suits you needs. Think about how many people will be using the tent, and how much gear or space you need, or how comfortable you want to be. From there, figure out how often you plan on using the tent and in what conditions. Either way, with these instant tents, just make sure you practise setting up and packing down several times, so when the time comes, you can set it up in seconds, relax with a drink in hand, and watch your mates struggle with their tents!